It is not uncommon to have severe hail storms in the Denver, Colorado area. Many homeowners wonder if the hail has damaged the composition/asphalt shingles on the roof. How do you determine if you need to call a roofing company or your insurance company to check for roof damage? Look in your gutters on the edge of the roof to see how much shingle granules are in the bottom of the gutter. This will give you an indication of how hard the roof was hit. The hail will knock granules loose and the rain washes it into the gutter. Providing you clean your gutters in the spring and fall, large amounts of granules means the hail dislodged them from the shingle surface. 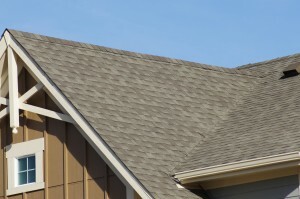 Checking the bottom edges of the shingles at the lap you may be able to detect if any damage has occurred. Look at the metal vents and flashings on the roof. If you see dents in the metal, that may indicate damage. If you have skylights or solar panels, check those for damage. Plumbing vent pipes can also be damaged from the hail. Concrete tile roofs are not as likely to be damaged from hail unless the hail is extremely large. After any major storm you should check your roof and exterior for any damage. If your gutters have a lot of tree debris from the hail, you should have them cleaned out as soon as possible so they can drain properly. See my post on Gutters and Downspouts for more information. Calling a roof professional or your insurance company and requesting an adjuster is the best way to determine if your roof is damaged from the hail.